Oregonians for Immigration Reform announces the launching of a new initiative: Initiative Petition 22 -- "Stop Oregon Sanctuaries" - to be placed on the November 2018 statewide ballot. OFIR is now collecting sponsorship signatures. "The law has effectively rendered ours a 'sanctuary state' for those in the country illegally. ORS 181A.820 undermines the rule of law generally and federal immigration law specifically, thwarts the enforcement efforts of the brave men and women who serve on our national-security front lines, and endangers innocent Americans and legal residents." As an example of the latter, Kendoll noted last summer's murder of three people in Woodburn. Bonifacio Oseguera-Gonzalez, an illegal alien who had been deported six times, is charged with this crime, is incarcerated and awaiting trial. "If not for ORS 181A.820," Kendoll said, "Oseguera-Gonzalez might have been identified previously as an illegal alien by state or local police and deported by ICE." OFIR vice president Richard LaMountain points out: "Illegal aliens can and do harm the very people to whom Oregon and its counties and cities owe their foremost responsibility: American citizens. For this reason, enforcement of U.S. immigration law is not extrinsic, but central, to the duties of state and local law enforcement." Besides the deaths and injuries to innocent citizens in Oregon caused by illegal aliens, there are significant fiscal costs to taxpayers for services to illegal aliens. The current threshold for initiatives to be placed on the 2018 ballot is 88,184 signatures of registered Oregon voters, collected by July 2018. Founded in 2000, Oregonians for Immigration Reform advocates ending illegal immigration and reducing the excessive levels of legal immigration. In 2014, OFIR spearheaded the successful Ballot Measure 88 referendum by which Oregon voters rejected Senate Bill 833 that would have granted legal driving privileges to illegal aliens. For further information about OFIR's goals and activities, see the website at: OregonIR.org. Oregon's sanctuary law when passed in 1987 was cited as ORS 181.850. It has subsequently been amended and is now cited as ORS 181A.820. Office built with input from victims impacted by crime. 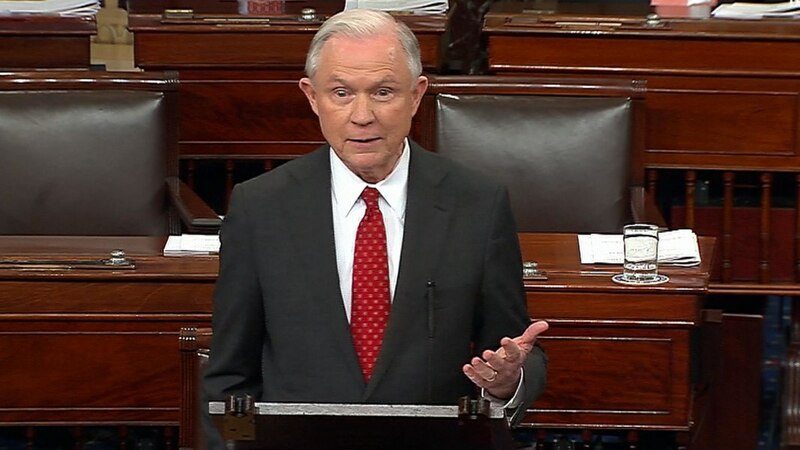 The Senate voted Wednesday night to confirm Sen. Jeff Sessions, R-Alabama, to become the nation's attorney general after three days of partisan acrimony over President Donald Trump's Cabinet nominees. The 52-47 vote proceeded along party lines, with one exception: Joe Manchin, D-West Virginia, voted with Republicans. Sessions himself voted "present." "It was a special night, and I appreciate the friendship from my colleagues — even those who, many of them, who didn't feel able to vote for me — they were cordial and so we continue to have good relations, and [I] will continue to do the best I can," Sessions told reporters immediately after his confirmation. This was the Sessions' second attempt at a Senate confirmation. His first attempt, in 1986, was for a federal judgeship, which failed after he was accused of racial insensitivity. Democrats, many of whom have worked with him in the Senate for years, opposed Sessions because of his positions on voting rights, immigration and women's health, among other issues. But their opposition wasn't enough to defeat his nomination, as it takes a simple majority to confirm Cabinet positions. "Everything he was accused of, I've never seen," said Manchin, the only Democrat to support him. "So I'm basing my knowledge of Jeff Sessions and who I think Jeff Sessions is, and I think he'll be fair and very deliberate of what he does. And I think he'll be very good at the rule of law and administrating it." OFIR would like everyone to know and understand what a sanctuary policy means. While the argument over the sanctuary status of college campuses or cities goes on, it's important to understand that Oregon is actually a sanctuary state. What does that mean? Find out more. OFIR's billboard campaign helps to educate the public about the fiscal burden of being a sanctuary state. Federal immigration law both imposes the responsibility and provides the means for the Federal Government, in cooperation with border States, to secure the Nation's southern border. Although Federal immigration law provides a robust framework for Federal-State partnership in enforcing our immigration laws ‑‑ and the Congress has authorized and provided appropriations to secure our borders ‑‑ the Federal Government has failed to discharge this basic sovereign responsibility. The purpose of this order is to direct executive departments and agencies (agencies) to deploy all lawful means to secure the Nation's southern border, to prevent further illegal immigration into the United States, and to repatriate illegal aliens swiftly, consistently, and humanely. PORTLAND, Ore. (KOIN) – After nearly 10 years of being on the lam, authorities in Mexico arrested the man accused of killing a deputy with the Marion County Sheriff’s Office during a two-vehicle crash in June 2007. And it’s likely Alfredo De Jesus Ascencio will be prosecuted in Mexico because he can’t be extradited to Oregon. The case began June 16, 2007 when Marion County Deputy Kelly James Fredinburg died while responding to back up another agency. With his lights and sirens on, Fredinburg was headed south on Highway 99E when an oncoming vehicle crossed the center line and collided with his patrol car, which caught fire. Fredinburg died at the scene. De Jesus Ascencio, who was 20 at the time, was identified as the driver of the car that hit Fredinburg’s patrol car. A passenger in De Jesus Ascencio’s car, Oscar Amaya of Woodburn, also died. On August 3, 2007, he was charged with 2 counts of criminally negligent homicide. Another passenger suffered minor injuries, and De Jesus Ascencio himself was seriously hurt. He was taken to the hospital and then later released. Officials believe he fled to Mexico before the grand jury indictment and the subsequent warrant could be filed. Detectives with OSP learned De Jesus Ascencio was last known to be seen in Woodburn around August 9, 2007. Once he made it out of the country De Jesus Ascencio began living in Puacuaro, Michoacan, Mexico, officials said. Under an agreement between the US and Mexico, the crimes for which De Jesus Ascencio was indicted in Oregon are not eligible for extradition from Mexico. It’s unlikely De Jesus Ascencio will ever be criminally prosecuted in Marion County for the 2007 crash. An Article 4 prosecution allows Mexican citizens who commit crimes in foreign territories to be prosecuted in Mexico. On Saturday, officials acknowledged Senator Ron Wyden and his staff, the US Department of Justice, the Office of the Attorney General of Mexico, California Department of Justice Foreign Prosecution Unit and local investigators for their efforts to locate and capture De Jesus Ascencio. Alfredo De Jesus Ascencio, left, is wanted on charges of criminally negligent homicide for the crash that killed Marion County Sheriff's Deputy Kelly Fredinburg in June 2007. (Salem) Two Southern Oregon lawmakers will hold a Legislative Town Hall Wednesday January 25th in Eagle Point to preview some of the issues expected to be debated during the upcoming 2017 Session at the State Capitol in Salem. The Town Hall starts at 6 pm on January 25th and is co-sponsored by State Representative Duane Stark (R-Grants Pass) and State Representative Sal Esquivel (R-Medford). Local residents are invited to attend the event which will be held at Eagle Point City Hall, 17 South Buchanan Avenue in Eagle Point. Alot has happened since OFIR's last meeting. We have reason to be optimistic for what the future may hold regarding enforcement of our immigration laws. Plan to attend OFIR"s meeting this Saturday, January 14 at from 2 - 4pm. We will talk about the 2016 election results and how they will impact us nationally and here in Oregon. The Oregon Legislature will open their 2017 session next month. We'll talk about the new legislation OFIR is proposing and also the likely oppositions legislation we will be tracking. OFIR President, Cynthia Kendoll will share photos and experiences about her week long exploration of the northeast US / Canadian border with Center for Immigration Studies. We have a packed agenda! Invite a friend and learn what you can do to get involved in 2017! Attendance is free and there is plenty of free parking! On Election Day, American immigration patriots won a remarkable victory. And thanks to our state's generous political tax credit -- explained below -- you can help amplify that victory right here in Oregon. First, though, consider what we've achieved. For the first time in years, we will have a friend rather than a foe in the White House -- a presidential administration whose immigration policies will put the interests of Americans, and not illegal aliens, first. President-elect Trump has pledged to secure our border and end the disastrous "catch and release" policy that has unleashed criminal aliens inside our country. He has vowed to reverse the Obama executive orders that have given de facto amnesties to millions of illegal aliens. And he'll work to push through Congress a law that will require employers, via E-Verify, to vet their new hires for proof of legal U.S. presence. In short, he has pledged to take the actions that we at OFIR have urged on our leaders for years -- and worked hard to achieve at the state and local levels. With your help, OFIR will continue that work -- to, among other things, repeal Oregon's illegal-alien sanctuary law, keep driver licenses out of the hands of illegal aliens, and assure that only U.S. citizens in Oregon register to vote. But to pursue these goals, we need your financial help. And Oregon tax law gives you an easy way to provide that help without it costing you a dime if you owe Oregon income tax. In Oregon, when filing their tax returns, taxpayers may contribute a certain portion of their state tax payment to an Oregon political action committee (PAC) -- $50 for those filing an individual return and $100 for those filing a joint return. In other words, you may elect to give money to a political action committee (PAC) that otherwise would go to the state government -- where it would be controlled by Kate Brown and the amnesty-supporting majority in the state legislature. But here's the catch: To take that state tax credit, you must make the contribution by the end of that tax year -- no later than Dec. 31, 2016. So before then, we hope you'll write a check or make an online contribution to OFIR PAC. If contributing by check, please write the check to OFIR PAC. Contributions to OFIR are not tax-deductible. Mail checks to OFIR PAC, PO Box 7354, Salem OR 97303. Thank you! Two years ago, by spearheading the successful charge against illegal-alien driver cards, OFIR helped set in motion the great patriotic wave that culminated on Nov. 8. We believe we've earned your trust -- and your ongoing support. During this historic time -- this new dawn for America -- help us continue our efforts with your donation today.